Microstegium vimineum.photo courtesy of the Piedmont Environmental Council.www.pecva.org (Accessed 5/2014). 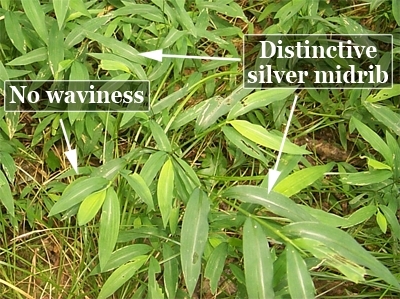 Microstegium vimineum is an annual, C4 grass (Winter et al. 1982 Horton and Neufeld 1997), 60 cm to 1 m long at flowering time, slender, reclining, branching, aggressively clonal, rooting at nodes, adventitious roots often long, branching, stilt-like; stems smooth, wiry, upper stems often turning purplish late in season, nodes smooth; sheath margins hairy near top; ligule to 0.2 cm long, membranous, usually fringed with hairs. Leaves alternate, lance-shaped, 5-8 cm long, 0.2-1.5 cm wide, flat, soft textured, bright yellow-green, sparsely hairy on both sides, base very narrow, midrib conspicuously pale, shiny, off-center (Tu 2000). Flower spikelets 0.5-0.6 cm long, paired, but only one is fertile, deciduous, glumes 0.5 cm, lemmas shorter than glumes, sometimes with a short awn 0.4-0.8 cm, self-fertile (cleistogamous or apomictic); inflorescence with few spike-like branches, 2-5 cm long, mostly hidden in upper leaf sheath until mature (Barden 1987); Aug.-Oct.; Seeds persistent in soil up to 5 years (Tu 2000), easily transported, seeds into moist to wet disturbed soil (Young 1996). Habitat: Moist soil in part sun or shade, (Horton and Neufeld 1997). Notes: Spreading aggressively, displacing native herbs, Appears to require disturbed forests, often along margins of trails and flood plains. Listed as a noxious weed in several states. Does best on open, moist soil with at least moderate light (Gibson et al. 2002). Able to produce seed with only 5% full sunlight. Soil pH 4.8-5.8 but also found on circumneutral soils. Earliest specimens from southern U.S. in 1919 probably used for packing material for porcelain from China and Japan (Tu 2000), reached NJ around 1959 (Fairbrothers and Gray 1972). Looks much like Leersia virginica (white grass) at first glance but is smooth to touch and often upland. Stilt grass is also loosely rooted and easily pulled up, L. virginica is a firmly rooted perennial, blade does not have pale midrib, and does not produce long stilt roots. Listed as one of the “top twenty” invasive alien plants by the NYS Natural Heritage Program’s Ad hoc committee on invasive plants. Can be controlled using a number of herbicides, pre- and post- emergents (Tu 2000).